If you are a follower of the VINE Vaccination Information Network Facebook Page, then you were probably left wondering recently why the posts had ground to a halt. The reason is that every single one of our admins were given a temporary ban by Facebook administration. There are presently 41 administrators of the VINE Facebook Page, and in the latter part of March, we all received the following notification upon logging in to our Facebook accounts. 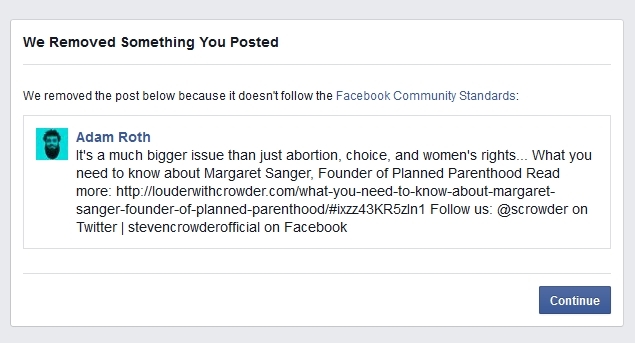 As you can see, the Post clearly does not violate any of Facebook’s Community Standards, but what about the link that the post contains? http://louderwithcrowder.com/what-you-need-to-know-about-margaret-sanger-founder-of-planned-parenthood/ – Nope, it’s simply a webpage which contains some of the more infamous quotes made by the eugenicist Margaret Sanger. I was really left scratching my head as to what was wrong with that post, but the worst was still to come. Facebook then delivered the standard temporary unpublish page screen, and then proceeded to ban my Facebook account for 1 week. Now here is the problem: I didn’t make that post. It had nothing to do with me, and it had nothing to do with 39 of the other admins. In fact, to this day, we still don’t know which admin made the post. If Facebook wants to ban an individual for making a post, then go ahead Facebook, but to ban 40 Vaccination Activists for something they did not do and played no part in, that is pure corruption. We immediately lodged an appeal to have our accounts reinstated, but of course this fell on deaf ears. We also asked Facebook to tell us who the offending admin was, but they refused multiple times. Now this brings up an interesting question (and I am not making any accusations against the offending admin, nor claiming this is a case of sabotage, and believe they did nothing wrong): Theoretically, what if there was a rogue admin who deliberately kept making posts which breached Facebook’s Community Standards? They could keep making these posts over and over again until the Facebook page was permanently deleted by Facebook administration, and Facebook would never tell us who the offender was in order to remove them as an admin to stop the posts. Something is very fishy about this situation, and the responses we have received from Facebook administration show lead me to believe that there is a deliberate effort to censor and suppress the truth about vaccinations. Oh wait, didn’t Mark Zuckerberg already say he was going to do that? Facebook are now refusing to respond to any correspondence in relation to this incredibly corrupt mass activist banning, and every single communication is responded to with the same automated email below, which although it states they will contact us within 24 hours, they of course never do. The bans have not only impacted us at Vaccination Information Network, but also impacted the vaccination community at large. Our admin list contains many of the top vaccination truth activists from around the world, and with the ban extending to preventing them from posting anything on their personal accounts or other Facebook vaccination pages that they manage, the impact was immensely multiplied. 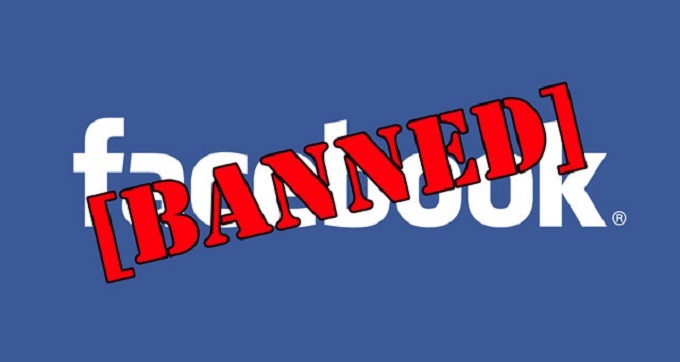 The ban is also on all of the activist’s records as a permanent black mark, and can be used as evidence against them in the future if Facebook wants to take them off their platform for good. In case of any future negative actions taken by Facebook against our page, please make sure you stay in touch by subscribing to our YouTube channel, and saving this website to your favourites or bookmarks list, or subscribe via RSS.